Domain de la Chauvinière is located on the top of the hillsides of the Maine river which gives its name to the appellation « AOC Sèvre et Maine ». The terroir is unique, a granite of Château-Thébaud, it represents only about 4% of the appellation, a small island in the heart of the Muscadet vineyard. The soil is shallow (20 to 30 cms), it consists of coarse elements: sand, gravel, pebbles. 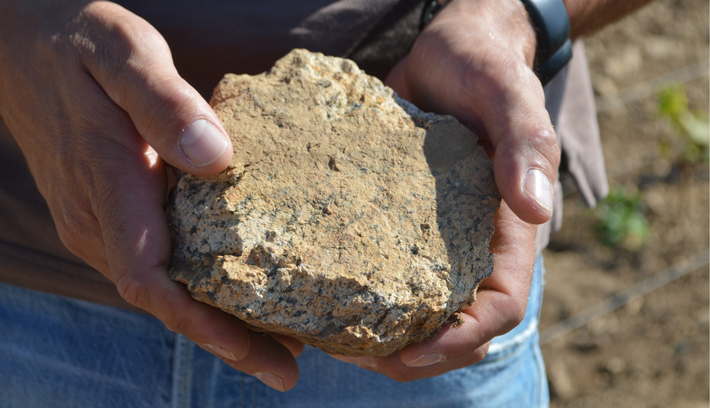 It is a hot and well-drained soil that guarantees an early budding of the vines. 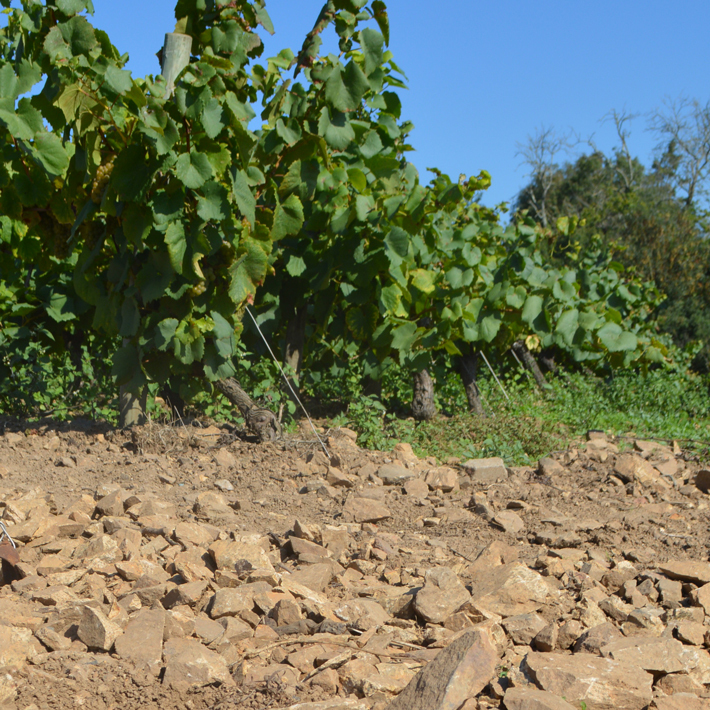 The bedrock (granite of Château-Thébaud) is faulted vertically and highly fractured. This allows the vine roots to go deep, where they always find some water and minerals to ensure the continuity of these cycles and thus offer us perfectly ripe grapes with a beautiful sugar/acid balance. This dwelling, well-situated on the top of a hill, along the Maine, has a chapel. As far back as we can go, writings show that it was a rest home for the missionaries of Saint Clément’s community, attached to the oratory. Then it became a home of Jansenism. In 1710, Chauvinière was also a resting place for Father Louis Grignon de Montfort, dead in 1716 and canonized in 1947. His works greatly inspired Jean Paul II especially his “Traitus of the True Devotion to the Virgin Mary” from which he devised his episcopal and papal motto “Totus Tuus”. His doctoral thesis is currently studied in Rome. During the Revolution, Chauvinière served as a hiding place for Father Agaisse, a priest who refused to sign the revolutionary agreements, no longer recognizing the royalty. 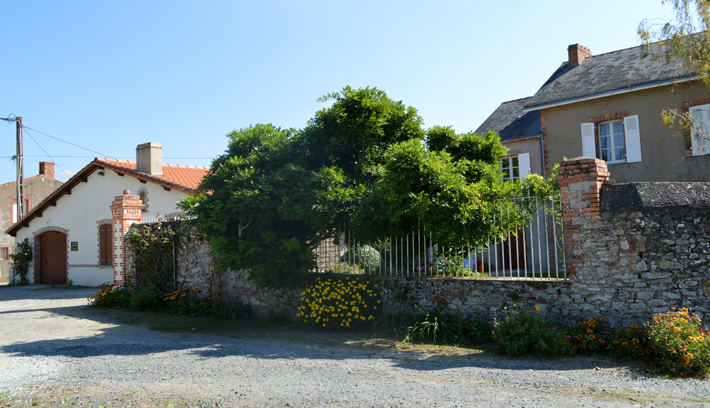 The cellars of the monastery, as well as the bourgeois house located on its right, were bought by my great grandfather Joseph Arnaud (wine grower and miller). His son-in-law Constant Huchet (my grandfather) took over the vineyard of 6 Ha in 1945. He formed the last plantings of young vines until he was 86 years old, and today still continues to check on our work with his almost daily tastings. Yves, my father, joined the vineyard in 1971 and in 2001 I took my place at their side. Our family has run the Domaine for 4 generations. We always vinify in foudre and oak barrels in the monastery cellars.